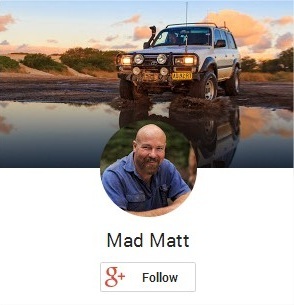 MadMatt 4wd | All things 4wd, camping and 4wd touring related. All things 4wd, camping and 4wd touring related. Welcome to MadMatt 4wd! Having a 4wd is a great way to enjoy so much of life and the great outdoors. A 4wd can take you places or it can test your driving skills. They are also a wonderful platform on which you can modify them to suit your personal tastes. I’ve been 4wding or close to them most of my life and have always had a fascination with going of the beaten track. So it makes sense that I would want to spend my days thinking about and playing with 4wds. Being in front of a video camera is a really fun way for me to share my knowledge and experiences with you. So if you’re on my webpage for entertainment or education I’m sure you’ll enjoy your stay. Make sure to subscribe to my MadMatt 4wds YouTube Channel to get the latest from MadMatt 4wd into your inbox.